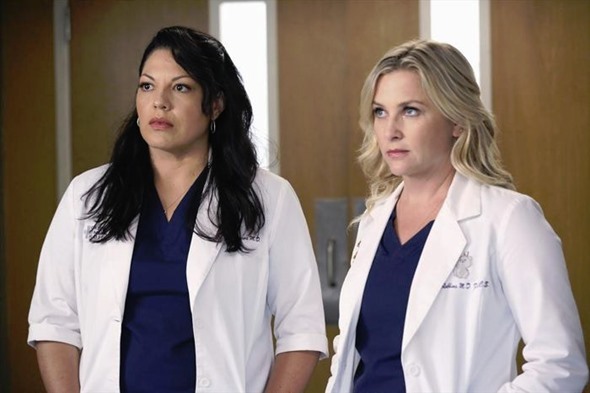 Grey’s Anatomy returned to ABC with season 12 last month, and the series has managed to reboot itself after the death of Derek Shepherd last season. That move angered many fans, and some wondered if the series would drop in the ratings and be cancelled by ABC this season because of the drastic decision made by Shonda Rhimes. Season 12 of Grey’s Anatomy has added some new faces and a lighter tone. It is not showing any signs of ending, but that has not stopped some members of the cast talking about the end of the series and where they would like to see their characters end up. Many of the stars of the series are hoping for happy endings. This is not always guaranteed on this ABC series. Derek Shepherd is not the only character to leave the series as the result of a shocking death. T.R. Knight, Chyler Leigh, and Eric Dane all ended their time of the series by having their characters die. What do some of the members of the cast want for the end of their time on the series? Check out some of the cast comments below. More can be found at The Hollywood Reporter. Chandra Wilson: It’s changing for her because initially it was having her family and pursuing her dreams. She’s kind of gotten all of that now. So I think it’s time for her to have some new dreams and goals. Jessica Capshaw: It would be so lovely for Arizona, having gone through a plane crash and divorce, to get to a place where she genuinely knew who she wanted and was able to figure out how to love and be loved in a really truthful way. Callie and Arizona are in the most amazing place. Part of the reason they have to go through so many different “this isn’t working out moments” is because until you knew that it really wasn’t working out — and you don’t champion them being together anymore — you weren’t going to be able to let go of it. Now, you know that they are not good together as they are now. Hopefully that will lend some air and space to them being happy for each other going forward. Sara Ramirez could not decide what she wanted for her character, but she did give some insights into the journey her character has traveled down since she joined the series in season two. I think that’s still to be discovered. Her life is continuing to evolve in a way that she didn’t necessarily expect but it could be about love but it could also be about her career and profession. How does a mother who is at the top of her game professionally pursue her true bliss if she feels it’s not there? Does she? Has she really captured her true bliss? Does she know what that is? Is that Sophia? Is it in a loving, romantic committed relationship? Is it in some way pursuing something new and different in her profession as a surgeon? Is it beyond that? She’s exploring new love and it’s a hot dating situation and there’s some unexpected twists and turns as always. They do it brilliantly and it’s in a way that affects a lot of people. It is not known when this series will end. Jessica Capshaw signed a new contract that would keep her on the series through season 15 earlier this year. That is not always a guarantee though. Patrick Dempsey departed the series in the middle of his two-year contract. Are you still a fan of Grey’s Anatomy? How long do you think this series can stay on the air? Tell us what you think. The show needs to end with Mer’s last moment of clarity. She has Alzheimer’s and imagined Derek dying and O’mally dying and Yang never leaving and Burke never leaving. It was all in her head. It’s an ensemble cast. Totally ditching a show over one character is kind of lame. I totally miss all the characters that have left but the show is still amazing. I’m definitely hoping for some happy times ahead for all the characters. I do kind of hope they bring back Callie Torres, but you never know what’s gonna happen. Refused to watch it after Derek was killed off. Good thing ’cause I definitely wouldn’t watch it after Jesse’s racist comments. Who’s calling the kettle black? You can absolutely be racist toward white people. You can be racist towards any race. Well, I absolutely love this show. I have seen it so many times and I can’t explain how incredibly amazing this show is. I think as long as you don’t drag it on TOO long it will be amazing, but I would just be sure that you don’t. I have not watched Greys since Derek was killed. He WAS the show and with him gone, I have no interest. Ohh my gosh. When he died, I literally cried. It was boring at first, but it got real good, real quick! This show has jumped the shark. Once a series that I eagerly anticipated each week has become one that I don’t care if I miss watching. I watch because I am familiar with the characters; some of which I actually like. But it’s just lost it’s appeal. It’s time to pull the plug on Grey’s Anatomy. Enough already with the talk of trains going to Grey’s sister’s crotch. It’s like a long running day time soap, where everyone has pretty much slept with everyone else on the show. And the constant chatter, as they work on someone’s body is annoying. I would never want to be a patient in that hospital. It seems like most of the doctors have not grown up yet. They can’t even control themselves to wait until they leave the hospital to have their booty calls. Enough! I think the show is better than it has been in years. Don’t miss Derek a bit. Sorry that they took the whole season last year to deal with him and thought the season last year was terrible – I thought Meredith’s reaction was completely out of character and the whole season seemed “off” to me. This year definitely seems “back to normal Shondaland”. Happy so far but if the show is going to end, let it end; PLEASE don’t leave us with a cliffhanger. Same here. In one summer, which for us is only two months, I watched seasons 1-12! I absolutely LOVE this show. While I was devastated by Derrick’s death, I’m a true super fan and I am enjoying watching how Meredith is utilizing her friends and family to rebuild and find herself after his death. So far, this season has been light and we are learning more about the new and older characters in a more personal way. It’s like the writers are giving us the fun we had falling in love with the newbeeis. Now we just need more traumas and a possible new love for Meredith.